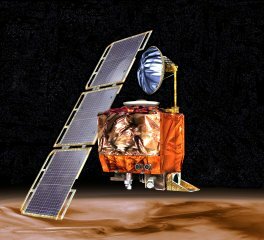 Mars Climate Orbiter was one of the Mars Surveyor 98 missions, launched on December 11, 1998 and lost on September 23, 1999 due to a navigational error. MCO was to have used a series of aerobraking maneuvers to achieve a stable Martian orbit but approached the planet too closely and is presumed to have disintegrated in the atmosphere. Its primary scientific instruments were the Pressure Modulated Infrared Radiometer (PMIRR) and the Mars Color Imaging system (MARCI). PMIRR was to have been used to observe the global distribution and time variation of temperature, pressure, dust, water vapor, and condensates in the Martian atmosphere, while MARCI was to have studied details of the interaction between the atmosphere and the surface. Although the loss of the probe was serious, the scientific investigations it was to have carried out have been performed by later missions in NASA's Mars exploration program.